Angie is a 2007 graduate of Northern Kentucky University, with a degree in Business Administration. 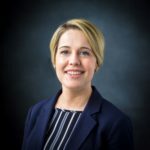 She joined Wealth Planning Corporation in 2016 after working for eight years as a Sales and Service Manager, the last five of which were with a local financial institution. Angie is married and she and her husband have two dogs. She enjoys time with family and friends. She is involved in a weekly Bible study group, has a passion for learning about animals, supports ethical fashion, and enjoys hip-hop dance, cooking, video gaming, and the occasional travel excursion.